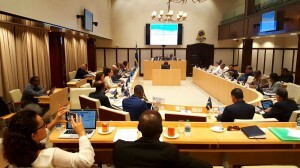 WILLEMSTAD - During the Central Committee meeting of the Curacao Parliament yesterday a majority of the MPs decided to appoint a special temporary committee to follow the process regarding the uncertain future of the Isla Refinery. Today a decision will be made by a majority during the public meeting. This committee is set for the further duration of the session of the current parliament until 2021 and will consist of 9 members of the 21 members and among others, Parliament Chairman William Millerson and Giselle McWilliam of the MAN will be part of the Commission. The Members of Parliament indicated that the parliament has an interest in timely and reliable information about the further developments of the refinery.